Spelling practice is getting harder and harder as spring has sprung, yet the grind of school continues. The request to taking time to practice spelling words is being answered with whines and complaints. That is why I am so excited about today’s tutorial on how to make DIY Letter Puppets. Kids Activities Blog knows if you can make spelling practice fun, it will happen! Making the letter puppets is the first part of the adventure. I enlisted the help of my 7 year old who was excited to participate once he saw paint and googly eyes were involved. We started with a package of Plaid 4″ Letter Stencils. These sturdy cardboard stencils were the perfect body for our puppets. We punched the letters out of the stencils and then started to paint. I started with the vowels and had my son paint all of them Apple Barrel Pool Blue and the other letters we varied the colors between Apple Barrel Petunia Purple, Banana, Candy Pink, and Lime Tree. We painted both sides and put several coats on the front for full coverage. Because the letters were cut out and we were working on cardboard, this was NOT a difficult painting project. It is something you can do together with your child. Once the paint had dried, we added a topcoat of Plaid Mod Podge Washout for Kids. It seemed to me to be very similar to the regular Mod Podge product, but the clean up was easier. My son rolled the Washout for Kids onto the painted letters with one of my favorite tools, the Mod Podge Roller Applicator. It makes this process faster and less messy. While the top coat was still wet, we added paper streamers to the letters for decoration in colors that coordinated with our fancy letter puppet color scheme. Once everything had dried, we added googly eyes to the front and craft sticks to the back for puppeteer accessibility. My son started with just having fun putting words together for his puppet show. We found that if he had a word longer than 4 letters it was hard for him to hold them during the performance. We added a strip of hook and loop tape (both sides) across the top and he could set the craft stick ends into it and it would stay allowing his hands to be free for more letters. We worked on his spelling words and sight words and then spelling his sight words. What I loved most about this project was working on it with him. The bonus was that he is excited to put on a puppet show for me and hardly even notices that we are studying! 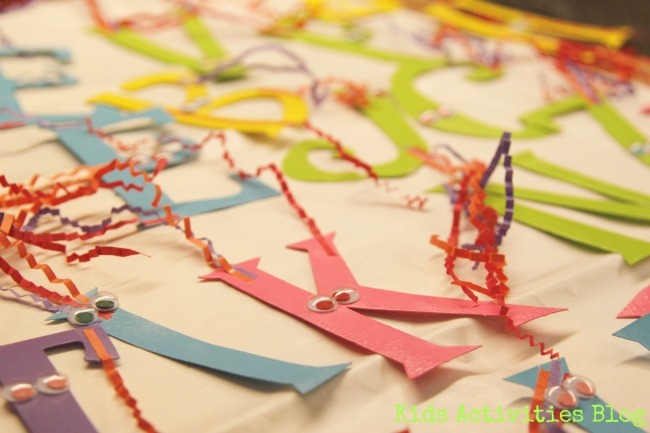 Visit KidsActivitiesBlog.com to see step-by-step instructions on how to make these cute, DIY letter puppets.